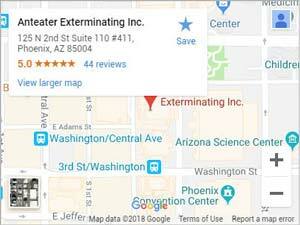 San Tan Valley | Anteater Exterminating Inc.
Pest Control Service – Knowledgeable local pest control experts near you. Need pest control but worried about cost? We offer competitive pricing on all our services. All of our technicians are trained and certified. Timely service that works with your schedule. If your home or business has a persistent pest infestation, call the experts who have served the area for nearly 20 years. Our methods are proven to work because they come from the best pest experts in the industry. Home service professionals should always respect your property, no matter the issue or time commitment. We do. Our entire pest control team has a stake in the community, which is why we’re the best in the area. Eliminate termites fast before they eliminate your home! You can always expect honesty and transparency from our team of technicians. With so many good service reviews, we know you’ll be happy with our work. We work with homeowners and businesses to deliver the best in ant removal services. Quality methods make us one of the best in the industry. We know all the clever tips and tricks to keep ants away for good. Ants don’t have to be a part of your everyday life. Though sugar ants aren’t poisonous, they are annoying and don’t make for appetizing food once they’ve infiltrated the cupboards! Count on us to inspect all areas of your home for carpenter ants, sugar ants, and any other type of crawling pest you may have in your home. San Tan Valley offers residents and visitors alike plenty of things to do. From shopping at the farmers market and bazaar to joining the excitement of dirt track racing at the local speedway, San Tan Valley is more than just a suburb of Phoenix – it’s a popular destination in itself. Outdoor enthusiasts can escape to the outskirts in the San Tan Mountains for hiking, wildlife viewing, and endless valley and mountain views. For a more relaxing way to spend the day, the San Tan Historical Society Museum walks visitors through the history of the area with a variety of interactive displays such as films, photographs, maps, and community projects.